A principal architect of Walgreens' transformation. DEERFIELD, Ill. — Walgreens is continuing to transform its retail business, and one of the principal architects of the transformation is senior vice president and chief merchandising officer Joe Hartsig. In recognition of his contribution, the editors of Chain Drug Review have named Hartsig its 2018 Merchant of the Year. 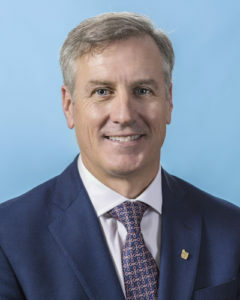 Hartsig, who joined Walgreens in 2015 and was named to his current post in April 2017, is building on a lifelong familiarity with the retailer. Born in Detroit and educated at Hillsdale College in Michigan, and later Northwestern University’s Kellogg School of Management in Evanston, Ill., he came to know and respect the chain from the customer’s perspective. “Our family grew up shopping at Walgreens, as it was always our go-to store for pharmacy services and so many things we needed quickly,” Hartsig says. Hartsig’s earlier business experience leaves him well equipped to accelerate Walgreens’ focus on extraordinary customer care in an environment with dramatic technology changes. His first 20 years of experience post-business school were in blue chip consumer packaged goods companies such as SC Johnson, Pillsbury and ConAgra, as well as consumer technology at Motorola, where he played key product leadership roles in emerging consumer wireless technologies. In these roles, he learned how to understand unmet consumer needs and build brand strategies to grow the many businesses that he managed. In 2009, he had an opportunity to work for Walmart on the Sam’s Club business as a divisional merchandise manager and then for several years as a general merchandise manager. He moved back to Chicago, where his family was raised and joined Essendant, a Fortune 50 wholesaler of business and e-commerce solutions to large retailers and office independents, as chief merchandising and marketing officer. After two years of helping reposition and rebrand Essendant, he had an opportunity to get back into consumer retail by joining Walgreens, which just happened to be located across the street. His first assignment at Walgreens was senior vice president of marketing and e-commerce, where he led category and brand marketing as well as loyalty and e-commerce. In that role, he was able to strengthen and expand the Balance Rewards loyalty program, create a marketing platform for the very successful Red Nose Day campaign that has continued to flourish, and launch “Whatever Makes You Feel Beautiful,” which supported the large expansion of beauty at Walgreens. At that time, he also orchestrated the focus on Walgreens.com by consolidating the many different websites — drugstore.com, beauty.com and skinstore.com — that Walgreens had earlier acquired. Walgreens had created very strong digital capabilities in the pharmacy and photo areas, but needed to get much more focused on building a retail product offering online and omnichannel capabilities. He moved over to lead the merchandising team a year later, aligning store merchandising with both regional and online merchandising for the first time at the company, to create more omnichannel synergies. Six months later, in the spring of 2017, Hartsig was named chief merchandising officer and took on additional responsibilities over merchandising planning and the Rite Aid integration efforts for merchandising and ­marketing. Since that time, Hartsig has been busy helping drive the broader transformation set out by Alex Gourlay, co-chief operating officer of WBA, who oversees Walgreens and Boots retail. Before this could really happen, however, one of the key things that needed to happen was to “step back and strengthen our foundation,” Hartsig says. At that time, Walgreens had been running too many promotions, many of which were not effective. These promotions also generated too many ad tags in stores that not only created a poor shopping experience, but also caused team members in-store to spend too much time and effort to hang them each week. This was valuable time that could be better spent caring for customers. Engagement with suppliers was overly tactical versus strategic, and margin contribution was eroding each year. Additionally, SKUs were growing at a constant rate each year, resulting in increased inventory levels. Lastly, Walgreens had a solid digital platform with a highly rated mobile app, but had not kept pace on retail omnichannel capabilities with a Web Pick-Up offering that had launched years before, but had not gotten traction with customers. Assortment planning was also improved, with a new and improved category line review process leveraged from Boots and tailored for Walgreens. SKU budgets were created by category, and also by format, so category managers had to think harder about what customers needed and where to place it by format type. The new category line review process brought much greater data analytics and insight, as well as financial analysis to the review, which helped reduce SKU counts in less strategic categories or lower-volume stores. These stores, otherwise known as “simplified stores,” have a lower volume of traffic and didn’t need the full range of assortment that was needed in, say, “corners” stores that would be in large suburban cities, for example, says Hartsig. The last key area for strengthening the foundation in 2018 was building a stronger omnichannel approach. With a singular focus on Walgreens.com, the team focused on improving the shopping experience online and via mobile. This included a tighter assortment that aligned with store items; improved search capabilities; easier navigation on the site; and the expansion of digital coupons for use online or in-store. The Web Pick-Up program was cancelled, and a new Ship to Store program was introduced that offered free shipping of items to any store in the country. “Our customers love this new program, given the convenient locations we have along their driving routes. Adoption has been really strong and continues to grow,” notes Hartsig. With a stronger operating discipline, the team has now focused on building upon this foundation. It’s pivoted to drive more balanced growth, while planting seeds for the broader transformation journey that Walgreens is undergoing across pharmacy, retail and omnichannel alike. In the beauty area, the company continues to accelerate its investment in building a stronger connection to existing and new customers. Phase two of a multi­year, multistage plan was successfully launched in 2018 with new cosmetics fixtures in-store, expansion of the best-selling No7 beauty line and the introduction of new brands like NYX. New beauty consultants were hired and trained, and the Balance Rewards Beauty Enthusiast program was expanded. Walgreens is taking the next step in its transformation, as seen in the newly remodeled Deerfield store. Here the teams are pressing forward with a new design as part of its focus on creating a modern retail offering that builds on Walgreens’ convenient locations and differentiates its stores. It’s a dramatic store change, starting with a broad array of new health services that include new optical and hearing centers, diagnostic lab testing services through Lab Corp, and an expanded pharmacy with new capabilities such as Express Pick Up. In the front end, health and beauty are joined up together to capitalize on the convergence of areas like skin care, sun care and personal care alongside an expanded array of health care solutions. Walgreens has introduced a third phase of its beauty program here as well, Hartsig claims, with an expanded focus on dermatological solutions and much better alignment of mass and prestige skin care merchandised together. Convenience improvements are also a key part of the new Deerfield store, says Hartsig. A new checkout area was designed for better line management as well as having more of the best items merchandised within arm’s reach. Additionally, Fed Ex services have been expanded to include packaging solutions, and a Sprint Express store has been successfully introduced, giving customers access to digital technologies and mobile solutions.